I’ve always loved bagels but haven’t actually bought them on a regular basis until recently. Paul found some at Market Basket recently, which are the store brand and are labeled “The Works” – wow, I love those! So I put them on the list the following week but he came back with something else completely, “thin” bagels that are cut into half the depth of a regular big chunky bagel. They are OK, but the only problem is that I have to make two of them to get my bagel fix! I normally don’t do fancy toppings, but I like the idea of them and have found these two sites above with some good suggestions. One I saw on TV the other day was to make a homemade burger or cheeseburger on a bagel which I hadn’t thought of before; I don’t know why. Bagels have less (? do they have ANY?) fat than regular rolls or buns, so all the better. I haven’t quite gotten to the point of wanting to make my own yet, but maybe one day soon… we shall see. Cheers for the bagel, so small yet so versatile! Great Canadian Bagel Burger at Taste of Home w/recipe. And last but not least, The Pioneer Woman’s Veggie-Cheese Bagel recipe. one egg, cheddar cheese, crispy bacon, and Dijon mustard on a plain thin bagel… perfection. But bagels come from eastern Europe, particularly the Jewish population. Those people who emigrated to New York brought their recipes with them and made a business of selling them. It worked pretty well, I’d say. Oh, yum! That sure looks tasty, Bex! And Dempster’s bagels. I’m surprised! Dempster’s is our local brand. As a matter of fact, we have a bakery less than a mile from here. My bread is the Thins bread. It has fewer carbs, which is what I need. I’m going to have to look around and see if we have the Thins bagels. Bagels are very high in carbs and the lower the better, for me. I love bagels but anymore, I purchase the thin ones like Paul brought home, I rarely use them for breakfast. I use them like I would use regular sandwich bread. I’m partial to raisin/cinnamon. Yummy post! I can’t picture or even remember ever not knowing about bagels… I guess they were a northeast creation and I lived here for the most part all my life. I grew up with them. But when I worked at company whose clients were from the Midwest, it was fun to serve them bagels. People in the northeast tend to be adventurous eaters, and we loved introducing our guests to foods they had never heard of. I never heard of bagels until I moved to New York City to go to school in the seventies. Got used to the touch sort that they had in baskets on the counters of the corner stores when I went to buy the Sunday New York Times. I don’t get much fancier than cream cheese for topping. Bagels! I love them. Most of the ones for sale in the stores contain my allergen, the one brand that does not has half the day’s quota for sodium in one bagel. I have yet to try making them myself, making them seems fussy to me. Now I have a craving! I will be on the lookout for lower sodium bagels, the next time I am near a grocery store! Five days a week, I eat half a bagel for breakfast. (Costco’s bagels are very hearty — two servings for a gal like me.) I gave up trying to slice them evenly. Instead, I cut them in half first — one O becomes two C’s. I then set them on the cut side, a nice steady position, while I slice each half. I stopped using cream cheese most of the time, because you read “fewer calories than butter” and then go overboard. So a teaspoon of butter on each. If they didn’t come with lots of seeds, I add my own mixture of caraway, celery seed, fennel, etc. I know, Sandy… that veggie bagel at The Pioneer Woman’s site looks to die for. 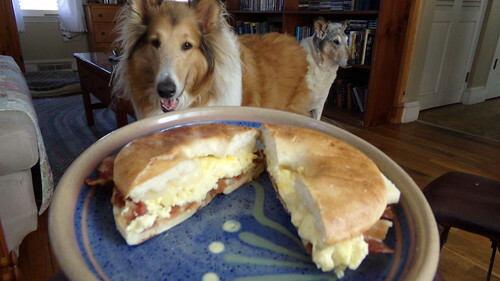 Anna, you should try bagels…the hole is fine…just put something on it that covers the hole, like lettuce in a lunch bagel, or cooked egg or sliced salmon – anything that will block up the hole… mine was so yummy and just hit the spot this morning! I have to say that these thin sliced bagels are a lot easier to eat and not so filling as the original bigger versions. I cooked one egg in a tiny crock in the microwave and put it on with bacon, a bit of cheddar cheese, and Dijon mustard. I can see using chicken or tuna salad on one of these… the possibilities are endless really. Oh my goodness..I was just about to leave on my walk and I read the last one you posted for recipes.the veggie one right below the burger one…a must do for sure. I use many things for toppings but favorite is cream cheese with raw sugar poured over it after it has been toasted. Also another is swiss cheese and cut up apple. Yes, I would be interested to know what YOU put on your bagels… I like peanut butter on one-half and cottage cheese on the other half. Sometimes if I have cut up a fresh pineapple, I will dice the pineapple and put on top of the cottage cheese too! Thanks for doing a blog on bagels….I never meant a bagel I didn’t love…fat or thin they all taste good. I am with you on the thin ones…takes two to get my fix. Love all the recipes you put in…now to get one out to eat while on my walk. I many times take one with me to nibble on. BTW..How many of you folks eat them and what kind is your favorite. Never a day goes by without me eating one. You’re very welcome, and thanks to Sandy-from-Iowa for thinking of this topic. Now I have to get out to the kitchen and toast up a bagel (or two)! Anyone who has a topic or web site that might be a good Shout-Out Sunday site, don’t hesitate to send it to me and I’ll do a write-up on it some Sunday! Email is fine, and mine is listed next to my name in this comment. Bagels on a Sunday morning! What a great topic. Thanks, Bex.